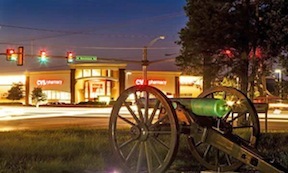 Pelham Corner at Fredericksburg would have been swallowed up completely by bright lights and heavy traffic had CVBT not preserved the location. Today, we’re pleased to welcome guest author Bradley M. Gottfried. I walked the fields of Fredericksburg, Chancellorsville, the Wilderness, and Spotsylvania many times while mapping the campaigns of the Eastern Theater of the Civil War. Studying the Civil War is my passion and, to date, I’ve written ten books because of it. The time that I devote to my studies of the Civil War, however, is limited by my “day” job as President of the College of Southern Maryland. This also restricts the time I can devote to nonprofit organizations. I felt compelled to make the time when the opportunity was presented to become a member of the Central Virginia Battlefields Trust (CVBT) Board. During battlefield visits, I am dismayed by the destruction of these sacred sites. Standing at the location of the mill race, now Kenwood Avenue in Fredericksburg, it is impossible to see the ground the men in blue traversed to ultimately be slaughtered before Marye’s Heights. The town of Fredericksburg has changed over the years as the ever-growing population engulfed those sacred grounds. The same is true at the Wilderness battlefield, where a housing development around Grant Lake has sprung up on the ground that saw very heavy fighting during May 5 and 6, 1864. On May 5, Henry Heth’s Division’s left flank valiantly held off charge after charge of an overwhelming number of Union troops. 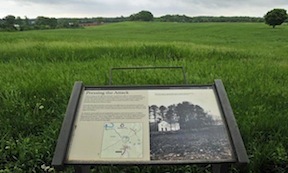 Gen. Wadsworth’s division traversed this ground on its journey to crush the Confederate defensive line on the early morning of May 6 and was the scene of heavy fighting as Longstreet’s men appeared later that morning. Many other troops thrashed their way through the thickets here. However, access to these sacred grounds is barred because of the private residences that dot the landscape. The heroic efforts of the Civil War Trust and the Gettysburg Foundation are celebrated for preserving historic sites. Less well-known is the CVBT, which concentrates its efforts in preserving the Fredericksburg-Chancellorsville-Wilderness-Spotsylvania battlefields. It is a big job: the population of Fredericksburg and its surrounding counties has increased 120 percent since 1970, four times the rate of growth of the rest of Virginia. The organization can count many successes over the years, including the preservation of over 1,000 acres of sacred land. They not only preserve the land itself but also act as advocates for battlefield preservation in general. For me, writing a check is not enough. I need to give back to those men who made the ultimate sacrifice by contributing my time and knowledge. That’s one of the reasons I write books and why I have decided to join a committed band of individuals who have such a passion for our nation’s heritage. There is much more work to be done, and it is my hope that more people will lend their support to this outstanding organization. Please take a moment to visit the CVBT website. Dr. Bradley M. Gottfried has worked in higher education for more than three decades as a faculty member and administrator. He is currently President of the College of Southern Maryland. An avid Civil War historian, Dr. Gottfried is the author of nine books, including: The Battle of Gettysburg: A Guided Tour (1998); Stopping Pickett: The History of the Philadelphia Brigade (1999); Brigades of Gettysburg (2002); Roads to Gettysburg (2002); and Kearny’s Own: The History of the First New Jersey Brigade (2005). Read ECW’s reviews of Gottfried’s The Maps of Antietam and The Maps of The Bristoe Station and Mine Run Campaigns. This entry was posted in National Park Service, Preservation and tagged Bradley Gottfried, Central Virginia Battlefields Trust, Civil War Trust, CVBT, Fredericksburg and Spotsylvania National Military Park, FSNMP, Preservation. Bookmark the permalink.